Blue River Table invites you to join us on board 'Tethra', our beautifully restored Cornish motor launch where we can offer you a perfect setting for an unforgettable meal experience. All our food is freshly prepared onboard Tethra with as much locally sourced produce as possible. The food takes inspiration from much of the travelling we have done and places we have lived whilst sailing. Expect some Mediterranean and Middle Eastern influences with lots of fresh flavours and ingredients. 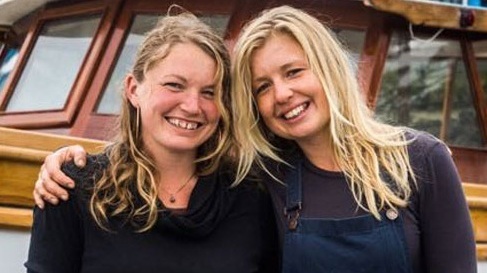 Blue River Table is the creation of Charlotte Whyte and Jess Harris who set out on a journey to develop something that incorporated their love of the local waterways, traditional boats and an exploration of fresh food and delicious flavours. Having spent most of their lives living and working on boats, both in the local area and all over the world they are not only experienced sailors but have a wealth of knowledge when it comes to combining the experience of chartering and cooking. ‘Tethra' is a 36 ft long traditional Cornish fishing boat. She was originally built in Looe in 1971 by Curtis and Pape to longline for mackerel and possibly even shark around the local area. She worked up until the late 80's and eventually made her way up to Chichester where we came to find her. She has since had an extensive rebuild, with much of the planking and framing above the waterline being replaced, a new deck and wheelhouse along with a new engine amongst many other things. This means that we have had a fantastic blank canvas to create the perfect dining space whilst keeping as much of the original character and aesthetic as possible. We love that we have a boat with a working and local history and hope that her latest incarnation will allow her to live on for many decades to come..